The correct heating of hot runner manifold systems is very important and is crucial to the success of the tool in production. There must be good heat transfer between the heater and the surface being heated or the heater will fail prematurely. Heater channels in the manifold should be smooth in order to achieve this and must not be left rough machined. This is the most common method of heating external cylindrical surfaces such as barrels, nozzles and tubular manifolds. 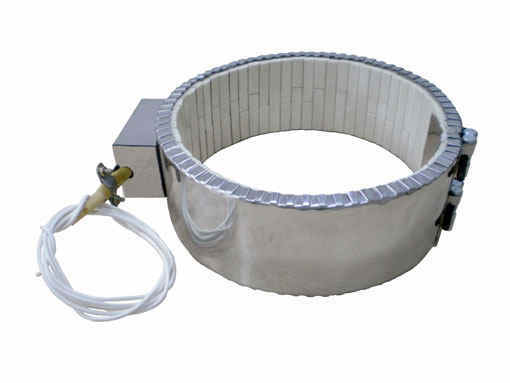 Band heaters give good uniform heating right across their width and are available in a wide range of wattages and sizes. Mica and ceramic insulation are usually used. Mains voltage operation is most common, although low-voltage systems are available at higher cost. Sizes up to 100 mm diameter by 150 mm long are available as standard but specials are available to order. Depending on the actual heating requirements, the coils may be progressively spaced further apart to provide a thermal gradient. This type of heater is most frequently used for obtaining thermal gradients on nozzles. Operation at 240 volts is most usual. A reasonable range of sizes is available but the range is more restricted than that available for band heaters. These arc mainly used to heat hot runner manifolds and internally heated nozzles, although they are also used for heating non-hot runner tools when processing at high temperatures. 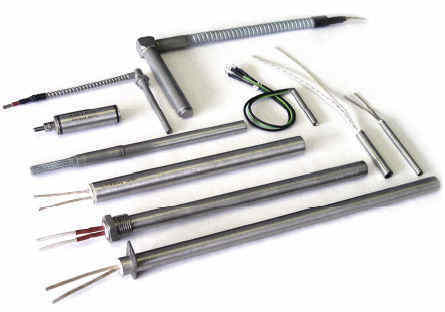 Cartridge heaters are available in a wide range of diameters, lengths and wattages. Sizes range up to 20 mm diameter by around 350 mm length. Special sizes are available to order. It is important that cartridge heaters are not operated at full power when heating up from cold as this can also lead to premature heater failure. To avoid this problem a low voltage (or temperature) should be applied for the first 15 minutes before switching over to full working temperature. As mentioned above, good surface contact between the heater and the manifold is essential to avoid premature failure problems. Inefficient heat transfer will also result with poor surface contact. Cartridge heaters are particularly prone to this problem. With existing tools that have poor surface contact problems, a heat transfer paste may be used. This will greatly improve heat transfer and prolong cartridge heater life but is not as effective as properly machined smooth channels. These are very similar to cartridge heaters except that they are semi flexible. This allows them to be carefully bent into shape to fit into non-straight-line channels. They are available in diameters of 6-8 mm and in lengths up to 1000 mm and are usually 240 volts. The same precautions regarding surface contact and low-power start-up apply to tubular heaters. If these precautions are observed, heater life is quite good. This is a different method of heating from any of the methods previously described. It consists of heating elements made from high-resistance wire which is electrically insulated on the outside. The wire can be cast into heated manifold systems or into torpedoes to form the source of heating in internally heated nozzles and bushes. The principles of heat pipes and heat rods have already been discussed in Chapter 11 on mould temperature control. Conventional heaters can only be located in easily accessible areas in a manifold, resulting in some areas of the manifold not being heated sufficiently. To combat this, heat pipes can be used to transfer the heat to these less accessible areas. This has the distinct advantage of greater simplicity of heater location and easier maintenance if the conventional heaters fail. Once again, it is essential to have very good surface contact between the heat pipe and the surface with which it is in contact. Heat pipes are very useful for reaching more remote areas of the manifold. As they can be obtained in smaller diameters than cartridge heaters, they can also reach areas that would otherwise be inaccessible.